The cove in La Jolla. 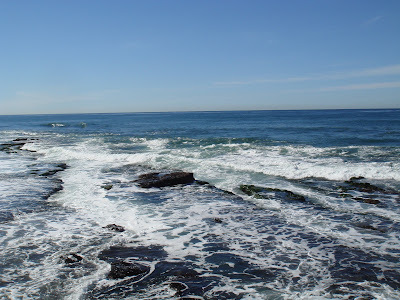 The Cove, in La Jolla is one of the most beautiful beaches of San Diego .The water is always a wonderful bluish green hue to it that is different from other beaches. The Contemporary Museum of Art is here, as are wonderful restaurants and shops. I noticed that this is where the La Jolla Bridge club is located also.Today with Tsunami warnings everywhere on the coastline of the Pacific, and the devastating quake in Japan the Pacific coastline is very dangerous. My heart goes out to the people of Japan, and also all the people affected by this disaster, now all over the world. One hundred years ago, this type of disaster would have killed many more, as there was no warning system for Tsunamis. Before telephones, and telegraph, this disaster would have been much more devastating to the entire world. It’s hard to imagine today, with all the technology and globalization, what it would be like to have no warning system at all. La Jolla, seals at the cove. The La Jolla, Children’s pool, also call the Casa, was built originally for the children of La Jolla to have a pool and beach of sorts that was protected for them to swim in. The wall which I am standing on and taking photos of, protected the beach. Over the years the pool has changed and the sand has filled in the pool area. It is still a popular place to relax, especially for the seals. Today you will find the children’s pool has been overtaken by seals. Roped off to the public, the seals are perfectly happy with that, they continuing to linger and lounge on the beach. I am sure some of the residents would like their beach back at some point. View of the La Jolla Cove. Beautiful day at the cove. Beautiful beaches, sunny weather, and lot’s of fun activities. We are having a blast. The pictures here are from Mt. Soledad in La Jolla, looking down at the La Jolla shores. The top of Mt. Soledad is a Korean War Memorial and is a very nice dedication to the Korean war veterans who served. I lived here year’s ago, so much has changed. View of La Jolla Shores. Cross at the top of Mt. Soledad. Flag at the top of Mt. Soledad. Beautiful cross at the top of Mt. Soledad. War memorial surrounding the cross at the top of Mt. Soledad.